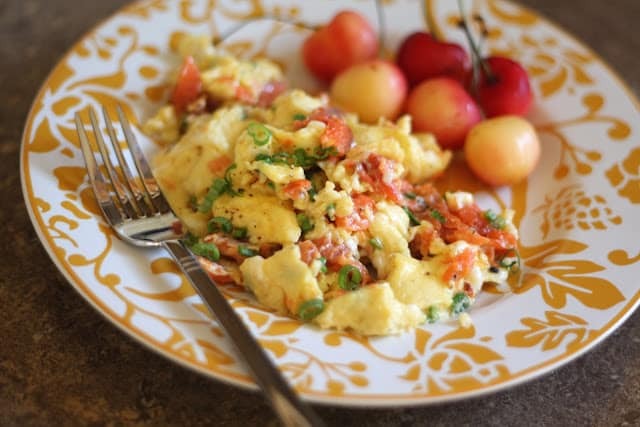 Creamy scrambled eggs with smoked salmon turned out to be an absolutely delicious way to start the day. We’ve been eating the smoked salmon that my husband brought back from Alaska every single day, as a snack or with breakfast lunch or dinner, it is fantastic all by itself. I have been looking forward to finally trying it in our eggs. My boys declared these the most delicious eggs they have ever tasted and they have already requested them again. Whisk together the eggs, half and half, salt and pepper and about 2/3 of the onions. Melt the butter in a large skillet over medium low heat. Once it is hot, pour the egg mixture into the middle of the pan (you want the butter to move to the edges of the eggs in the pan) and cook without stirring for a minute or two. Once the eggs begin to set, gently stir or fold the eggs as needed until the liquid is almost completely gone. At this point, fold in the smoked salmon. Stir to combine and then remove from the heat. Let the eggs rest just a minute more to finish cooking. Enjoy! 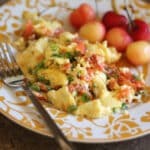 I love smoked salmon scrambled eggs! And fresh salmon from Alaska?? I'm so incredibly jealous!!! Smoked Salmon is one of my favorite preparations of salmon. i've never thought of putting it in eggs though. Will have to try that next time i get my hands on some! If I could get my family to eat salmon in their eggs, I would be delighted. Looks delicious! I wish I was at your house for breakfast this morning....YUM! Looks delicious Mary and I also like smoked salmon in scranbled eggs. How about a new giveaway...a few pounds of smoked salmon for one lucky reader? This looks like the ultimate breakfast to me! That would be a great dinner, too, with some fresh bread! I lucked out and my husband brought a whole lot of it back from Alaska this summer! I have bought it at Trader Joe's in the past though and I know Whole Foods sells a great salmon as well. Yumm, brunch is screaming out at me! Good choice.. I take mine to the next level, Sort of a play of Lox and Bagels, I get some cream cheese at room temp, dice up some red onion, when you pour the egg mixture into the pan add the red onions, right before the eggs set, place the cream cheese in with the eggs, and fold the or scramble them. Once that is done, place the salmon in the egg mixture. The cream cheese give s creaminess to the eggs and with every bite you think you are having lox and cream cheese.. Very yummy. I could start everyday with this breakfast. Hope you're having a great weekend Mary! When I stumbled upon your post, I directly printed your recipe. And today's breakfast I was accompanied by smoked salmon scrambled eggs. It was so yummy and made my morning. Thanks for sharing.